Astronomers have used NASA's Chandra X-ray Observatory to discover a ring of X-ray power. This ring sounds like it might belong in Tolkien's Middle Earth, but it is, in fact, found in a galaxy about 300 million light years from Earth. The galaxy called AM 0644-741 is what astronomers refer to as a "ring" galaxy. Taking a look at the image quickly reveals why. Astronomers think ring galaxies are formed when one galaxy smashes into another in a catastrophic collision. 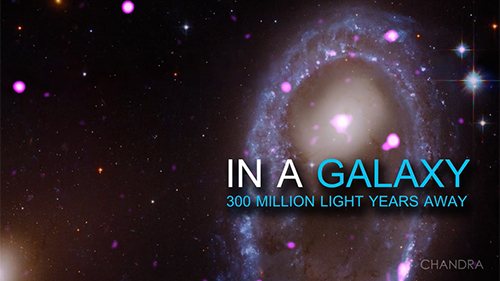 The impact generates ripples in the interstellar gas of the targeted galaxy. These ripples, in turn, trigger new waves of star formation as gas expands outward from the site of the collision. The most massive of these fledgling stars will lead short lives — in cosmic terms — of millions of years. After that, their nuclear fuel is spent and the stars explode as supernovas leaving behind either black holes with masses less than about a hundred times that of the Sun, or neutron stars with a mass approximately equal to one and a half times of the Sun. Some of these black holes and neutron stars have closecompanion stars, and siphon gas from their stellar partner. This gas falls towards the black hole or neutron star, forming a spinning disk like water circling a drain, and becomes heated by friction. This superheated gas produces large amounts of X-rays that Chandra can detect. Astronomers are on a quest to study AM 0644-741 and others like it to better understand the origins of ring galaxies and the intriguing objects that they contain. A new ring of black holes or neutron stars has been discovered in a galaxy about 300 million light years from Earth. 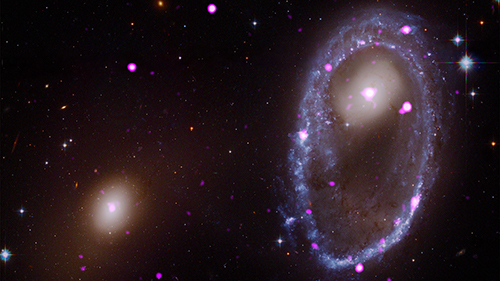 This ring was forged when one galaxy smashed through the middle of another, creating ripples in the gas. As this gas expanded through the impacted galaxy, called AM 0644-741, it triggered waves of star formation. The most massive of these stars lasted only a few million years, before exploding as supernovas and leaving behind black holes or neutron stars as their remains. NASA's Chandra X-ray Observatory can detect some of these black holes and neutron stars as they siphon off material from stars that orbit them. Studying 'ring' galaxies such as this one will help astronomers better understand what happens when galaxies clash in catastrophic impacts.